Teen Patti is a gambling card game that originated in the Indian subcontinent and is popular throughout South Asia. Teen Patti is similar to Three Card Poker and the British game of Three Card Brag with some minor differences. Teen Patti or Indian Poker is also referred to as Flash or Flush. It is extremely popular in India especially during the Diwali festival. Ultimate Teen Patti is the best Teen Patti app available in the play store. Ultimate Teen Patti has the highest number of users when it comes to Teen Patti games. 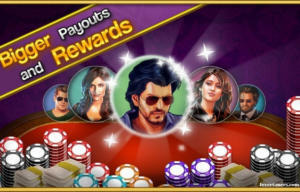 When you install the Ultimate Teen Patti app on your mobile devices, you get free 3,00,000 chips. You also get free chips every few hours so never run out of chips. Teen Patti card game uses a standard 52 card deck. The game can be played by 2 or more players. It is normally played in a group of 3 to 7 players. Each player is distributed with 3 cards from the 52 card deck. The cards are usually distributed anti-clockwise. Before the cards are distributed, a boot amount is decided and collected from the player. The boot amount is the minimum stake amount put in the pot, kept in the center of the table. As the game progresses the pot money grows and is won by the winner of that highest hand. The player who remains in the game until the completion of the game who has the best hand wins the game. 1- Three of a Kind or Trail —When a player gets 3 cards of the same rank then it is said to be Three of a Kind or Trail. Here, three aces are the highest and three 2’s are the lowest. 2- Straight Flush : When a player gets 3 consecutive cards that belong to the same suit then it is said to be Straight Flush. Highest Straight Flush is A-K-Q of the same suit. 3-Straight : When a player doesn’t get 3 consecutive cards that belong to the same suit then it is said to be Straight. 4-Flush or Color : When a player gets 3 cards that aren’t consecutive but belong to the same suit then it is said to be Flush or Color. Highest Flush or Color is A-K-J of the same suit. 5-Pair/Two of a Kind : When a player gets 2 cards that have the same rank then it is said to be Pair or Two of a Kind. In the game, the highest pair is A-A-K and the lowest is 2-2-3. 6-High Card : When a player gets 3 Cards that don’t resemble the above-mentioned ones. In Teen Patti card game, the player can either place a bet by seeing his/her cards or without seeing the cards also called blind. When the player sees his cards, he/she has an option to either play chaal or fold. A player who places a blind bet is referred to as the blind player. A player who places his bet after seeing the cards is referred to as the seen player. Blind-For playing blind, you must not see your cards. You have options to pack, blind and chaal. To play Blind you have to put the bet amount in the pot. The Blind bet amount is equal to the current stake amount or twice the current stake amount. Seen- If you have seen the cards then you can play Chaal or Pack. Once you have seen your cards, you can play chaal or bet higher or you can ask for a sideshow with a player next to you if he has already seen his cards or you can pack. Ultimate Teen Patti offers various Teen Patti games. You can choose to play the one that you like, Classic Teen Patti game where you have lower boot tables, No-Limit Teen Patti gives you complete freedom to choose the boot and bet. Tournaments are a unique feature of Ultimate Teen Patti. You can compete with the players to win awesome prizes. 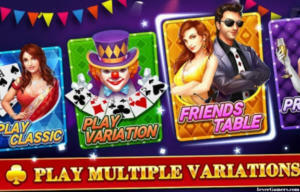 Teen Patti Variations are also offered by Ultimate Teen Patti. They include Hukum, Muflis, Lowest Joker, Higher Joker, and 10x boot. With these unique features, Ultimate Teen Patti becomes the best choice for players around the world to play with and have ultimate fun. Sweet article and addictive game … Playing the game for the last 2 hours.